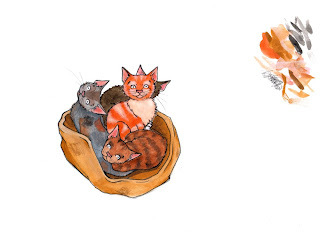 Another sketchbook instalment for you- here is a bagful of Kitty shaped deliciousness. There are a few more in the works, not kitties this time but other anthropomorphic characters (which may or may not be clothed). I am also mapping out characters for a new story which is top secret at the moment! I will tell you, however, that it is based on an imaginative and adventurous little boy and his very bossy little sister, with illustrations inspired by my Waterstones pitch (see older blog post entitled 'Waterstones Picture This!'). For now, please enjoy my sketchy kittens. Oh I just love them!!! I like your new banner and profile picture. Thankyou so much for all! I like your explanation of your name, too. I grew up watching Blackadder!